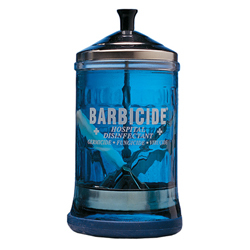 King Research Barbicide® Mid-Size Manicure Jar features total immersion, custom molded glass, stainless steel self-draining basket and non-slip rubber ring base. Holds 21 fl. oz.